It was not how you'd expect a memorial service for a BBC news presenter to be. How many other people could pull in the current number one pop group to perform in their memory? 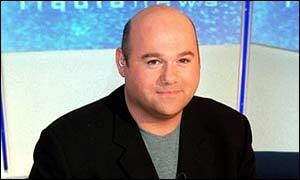 But Christopher Price was no ordinary news presenter, and this was a very special service. About 200 family, friends and fellow BBC colleagues attended the Saturday morning service at the trendy Mezzo restaurant in Soho. Despite the shocking loss of a immensely talented man at such a young age, those present were determined to celebrate the 34-year-old's life. Right from the start, his boss - BBC Choice controller Stuart Murphy - raised a laugh when he offered everyone "a big fat gay bald welcome" to the event. The motto for the morning, he said, would be "it's what Christopher would have wanted" - "and if you want to cry, I suggest you get very drunk first," he added. There were a few tears, but also raucous laughter. BBC reporter Robert Nisbet told tales of wild nights out with his best mate. Nightclub promoter Wayne Shires backed up his yarns with snapshots of the presenter out on the town - hobnobbing with Yoko Ono, and gossiping in the back room of his club. "He became something of a gay icon, and we often had to perform the role of pretend boyfriend to protect him from unwanted attention," he said of his pal who would often turn up on a Saturday night, with a bottle of vodka, ready to start a big night out. He added: "Despite what you've read in the press, he was living his life to the full, and loving every minute of it." Colleagues testified to his professional skills. Liquid News reporter Stephanie West said: "He'd want to know you'd got your facts straight - then he'd sprinkle it with humour, and we'd be vying with each other to get the best top line in our scripts, to make him laugh the most." Show regular Emma Kennedy added: "He gave 110% all the time, and he expected everyone else to too. If you didn't make the effort, he'd let you know about it." But it was his role in nurturing talent which was also highlighted. Liberty X told how Liquid News was the first show they'd appeared on together and how he loved their new single Just A little. Actor Adam Rickitt read from the musical Rent, and told how Price's kind words had encouraged him. The memorial was timed to coincide with the Eurovision Song Contest, and former UK contestant Nikki French performed. So did tribute act Boom Bang A Bang - getting the room clapping along to Congratulations and Oooh, Aaah Just A Little Bit. Like I said earlier, this was no ordinary memorial service. Price's family and friends mixed with BBC colleagues, as well as Liquid News viewers touched by his sudden death. All left knowing they were far richer for having experienced his talents.